Dorothy Ann De Vries obituary. Carnes Funeral Home. 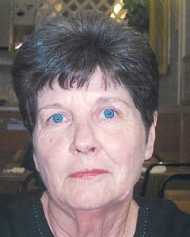 Dorothy Ann De Vries, of Texas City, Texas, passed away at her home on October 22, 2017 with her family by her side. She was born on August 17, 1943 to George Albert Hayes II and Dorothy Louise Johnson. She was a loving wife, mother, grandmother, and great-grandmother, aunt, and friend to many. She is survived by husband, Angelo De Vries, her children, Debbie Trosclair, and husband, David, of Wylie, TX, Angelo "Bubba" De Vries, Jr. and wife, Sandy, of Baytown, TX, and Deanne Schurwon, and husband, Frank, of Texas City, TX. Her siblings, Patsy Ceccacci, George Hayes, Bobby Hayes, and wife, Sheila, Barney Toler and wife, Victoria. She had 8 grandchildren, Justin and ColtonTrosclair, Hayley Hoover, Angelo III and Savannah De Vries, Arlene Wilkerson, Kailey and Brayden Schurwon, 12 great-grandchildren, and numerous nieces and nephews. She is preceded in death by her parents. She loved having family over for the holidays, watching the Astros, and enjoyed going to her kid's, grandkid's, and great-grandkid's sporting and school events, buying lottery tickets and scratch-offs, and going to the casino. She loved talking to people and never met a stranger. There wasn't a place she would go that she didn't know someone! She was an avid Astro fan!! She lived long enough to see them make it to the World Series. She was a member of the St. Mary of the Miraculous Medal Community. A visitation will be held on Tuesday, October 24th from 5:00 p.m. - 7:00 p.m. with a Rosary beginning at 7:00 p.m. at Carnes Funeral Home, 3100 Gulf Freeway, Texas City, Texas. Funeral Mass will be held at St. Mary of the Miraculous Medal, 1604 9th Avenue North, Texas City, Texas on Wednesday, October 25th at 10:00 a.m. Reception to follow at Ponzini Hall at the Church. She will later be cremated.